SQL injection in Joomla  extension DT Register  by DTH Development  allows remote unauthenticated attacker to execute arbitrary SQL commands via the cat parameter. If you open "DT Register" functionality on some site and open calendar module, then you can see choice of categories. First thing to notice is that Content-Type for json formated response is text/html. And site uses HTTP. But ok, let it be. Let's play with "cat" parameter. If to put just additional " at the end of cat value (6"), we can get error 500 already. For attacker it's quite easy situation. It's possible to "fix" SQL with just closing the bracket and commenting out rest of it. All events are displayed to output. Exploiting - Let's read the data out! As DTH Demo site have "enterprise grade firewall" and I did not have permission to test this site, I built exploit on the site where I had permission (bugbounty / hall-of-fame). First question after Proof-of-Concept for SQL injection vulnerability is - can we use UNION construction in SQL. At least in my opinion it is the fastest and simplest way to read the data out. ... -- of course I didn't use all numbers between 1 and 112 .. So, we have 112 select fields! 112! Assumption: one of those 112 select fields is eventId and correct value is needed for next query. Let's try out with valid eventId - we saw some real eventId values previously, when we read out all events. and boom! I have JSON formated output. New challenges: in what position is eventId and from what position I can get some data back to the output. For detecting fields in the output, we need to create some "hopefuly unique" fields and detect them in the output. string(149) "<img border=\"0\" alt=\"\" src=\"/[path-removed]/calendar?controller=file&amp;task=thumb&amp;w=60&amp;h=60&amp;filename=images/dtregister/eventpics/100073\" />"
13     4        1    "<span id='event_4'>100015<\/span>"
15     100015   1    "<span id='event_4'>100015<\/span>"
21   "<img ... src=\"\/[path-removed]\/calendar?controller=file ... &amp;filename=images\/dtregister\/eventpics\/100073\" \/>"
We can not use position 8 (100008) as it's presented back as int. We can not use position 13, because we need to keep there correct eventId value. Sometimes there does not come output on position 5. The best one so far seems to be output position 9 (and also 12), which cames from the last select field from SQL ("l.name as loc_name"). On SQL SELECT position 13 I use correct eventId value, in this case 4. On last SQL SELECT position (112) I read some data out - for Proof-of-Concept I just execute USER() function. Just WOW! 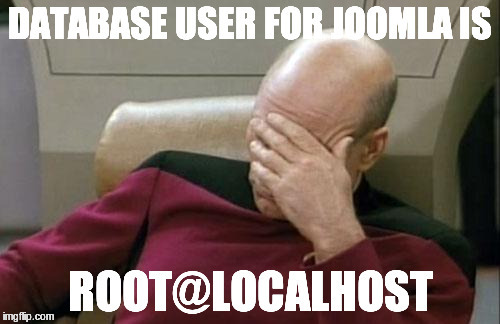 Who can have idea to run Joomla as root? First - about ethical hacking. Publishing full conversation is a bit gray area. Usually I am not doing that. In this case - vendor is arrogant, did not want to fix their problems, started talking about "what kind of serious problems I may face". This is the reason why I am sharing it - clients of this vendor are paying for that product and they have right to know about it. It is not nice and ethical from my side to hide it. 2016-10-17 | me > DTH | via web form - I would like to report some security holes. What is the correct way for that? 2016-10-18 | me > DTH | any response? One passed week, no response. If there will be no response, I publish findings as Full Disclosure in 0-day status in 1 month from first contact, 17th of November. 2016-10-25 | DTH > me | Respnse from Richard Brown, copy sent to Nathan Gifford and also to support@sitelock.com. We were going through our client list and we don't have you listed in there so we are not sure what you are requesting. Our site (dthdevelopment.com) is protected by an enterprise grade firewall along with being monitored and protected already by a 3rd party called Sitelock. If you have some specific issues can you please let us know? Also, if you have a login under a different customer it would help us in servicing your request. yes, that's correct, I'm not in your client list, I'm whitehat hacker / security researches and I have found some security holes in your product "DT Register - Events & Calendar". From ethical hacking point of view I would like to let you know those details and then you can provide fixes. There is one SQL injection and few XSS vulnerabilities. And with XSS it's relatively easy to bypass your "enterprise firewall". Firewall can give just slowdown, not protection. Also it's not a really valid argument "we are protecting our solutions with firewall" and we sell the same solution to clients who are not using firewalls. Program must be secure without firewall. If you are a whitehat hacker (implying an ethical hacker) then you will share the specifics with me regarding the SQL injection and XSS vulnerabilities. If you have been hacking into an installation of DT Register then it is also possible that the customer's implementation is either old or not properly done. If that is the case then you really need to reach out to that client. If that isn't the case then there may be a serious problem you face. Some countries prohibit the use of websites for ethical hacking without the owner's permission. If it turns out that the website is your own then you have an illegally obtained copy of DT Register which means there is a more serious issue to address. So you need to disclose specifics. > "If you are a whitehat hacker (implying an ethical hacker) then you will share the specifics with me regarding the SQL injection and XSS vulnerabilities." I think I shared details with separate email, which I sent right after first one. Including Proof-of-Concept URL's and screenshots. > "If you have been hacking into an installation of DT Register then it is also possible that the customer's implementation is either old or not properly done." I found the vulnerability using black box method on a customer installation, and I verified on your demo site, that there problem is there. In that case you have also not up to date installation. > "If that is the case then you really need to reach out to that client." > "If that isn't the case then there may be a serious problem you face. Some countries prohibit the use of websites for ethical hacking without the owner's permission." It was done under bug-bounty/hall-of-fame program. > "If it turns out that the website is your own then you have an illegally obtained copy of DT Register which means there is a more serious issue to address." No, I don't have any copy of the software. > "So you need to disclose specifics." In my opinion I did that. To conclude the situation - instead of fixing named bugs you start describing, what kind of huge problems I'm going to face. Is this your official way to resolve security holes in your program code? Can I share this answer as "official response from DTH when you help them to improve security"? If I could want to fight with you or use it illegal way, I could sell those security holes on black market. For some reason I'm here and typing this letter. Getting this kind of attitude and response force me to ask from myself - why the heck I try to help someone if they start threaten you. Think about that. Think about your alternative scenarios. #1 Can you confirm, that you got technical details? #2 Do you have plans to fix mentioned security holes? As Richard from DTH really does not respond, I made "last call" and sent letter to all participiants in first email. 2016-11-11 | me > DTH, SiteLock | Last call. > If there will be no response, I publish findings as Full Disclosure in 0-day status in 1 month from first contact, 17th of November. > #1 Can you confirm, that you got technical details? > #2 Do you have plans to fix mentioned security holes? Another 9 days passed, still no response. Not admitting to the security vulnerabilities in your product, which you are selling to your paying customers, is not ethical and puts your customers' data at risk. Instead of taking the information, which I have ethically provided you with, and fixing your product, you begin to issue threats. Please inform me whether or not you will be fixing the security vulnerabilities which I have emailed Richard on October the 25th, 2016. Here is how we can proceed: I will be informing cert.org regarding the vulnerabilities which I have disclosed to you. The decision whether this will happen before or after you have fixed them is up to you, and as I wrote previously, I await your confirmation on if, and when that is going to happen. Based on your feedback so far, I am unsure if the real threat to your product is your attitude towards security, or the actual security vulnerabilities themselves. It would seem that the latter is a result of the former, in any case. 2016-11-11 | SiteLock > me (CC to DTH) | "Can not find your account, can not open ticket"
2016-11-11 | SiteLock > DTH (CC to me) | "I will close the ticket. Please let me know if you are having any security concerns with your account"
This is on our demo site. It was configured to be open in the setup. I am working internally with one of our support people on changes to make. This site is useful for prospects. As soon as we make changes I will reach out to confirm closing the ticket. Configured to be open? Configured to have SQL injection and XSS vulnerabilities? :) Anyway, they probably fixed the problem and made new release on 15h of November. One down, 2 to go. 2016-12-05 | DTH > me | "Sorry, forgot to respont on this. We closed the problem on our demo site". 2016-12-05 | me > DTH | SQL injection seems to fixed. XSS vulnerabilities are still there. Asking CVE for this case was not really faster communication. request appears to match these criteria. CNA is not currently assigning CVE IDs to embargoed vulnerabilities. So, I did not check MITRE criterias carefully enough and asked CVE from wrong place. Let's try to ask it from correct place then - DWF project . 2016-12-11 | me > DWF | Is there any hope to get feedback? Anyway, vulnerability seems to be fixed. No CVE assignet. Yet. And finally, CVE is also assigned. Additionally reported XSS vulnerabilities are still there (will be fixed in next version). Update your DT Register plugin. Using payable solution does not guarantee quality. 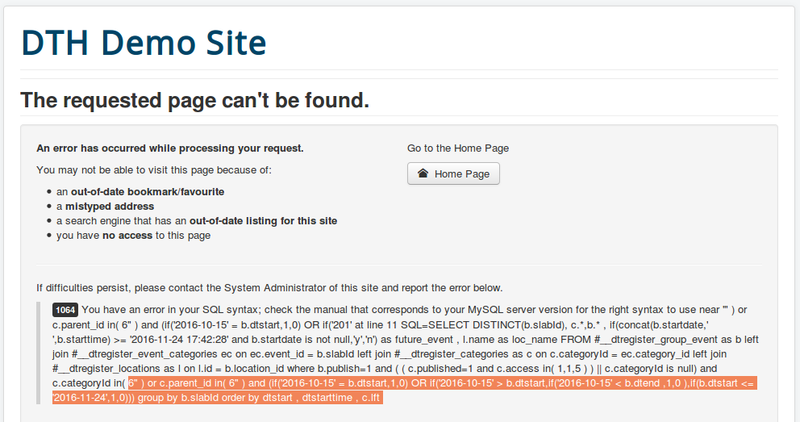 FullDisclosure: "SQL injection in Joomla extension DT Register"
VulDB: "DTH DT Register Extension up to 2.8.17/3.1.11 on Joomla index.php cat sql injection"